288 pages | 96 B/W Illus. 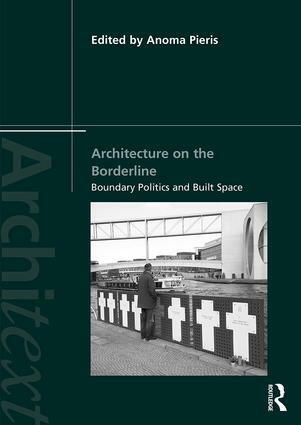 Architecture on the Borderline interrogates space and territory in a turbulent present where nation state borders are porous to a few but impermeable to many. It asks how these uneven and conflicted social realities are embodied in the physical and material conditions imagined, produced or experienced through architecture and urbanism. Drawing on historical, global examples, this rich collection of essays illustrates how empires, nations and cities expand their frontiers and contest boundaries, but equally how borderline identities of people and places influence or expose these processes. Empirical chapters covering Central Asia, the Asia Pacific region, the American continent, Europe and the Middle East offer multiple critical insights into the ways in which our spatial imagination is contingent on ‘border-thinking’; on the ways of being and navigating frontiers, boundaries and margins, the three themes used to organise their content. The underlying premise of the book is that sensitisation to border conditions can alter our understanding of the static physical spaces that service political or cultural ideologies, and that the view from the periphery opens up new ways of understanding sovereignty. In exploring these various spaces and their transformative subjectivities, this book also reveals the unrelenting precarity of contesting and living on the margins, and related spaces and discourses that are neglected or suppressed. List of Figures. Preface and Acknowledgements. Introduction.Part 1: Frontier. 1. Eurasia's Historical Space of Palimpsest - Desert, Border, Riparian and Steppe Manu Sobti. 2. Intersecting Sovereignties: Border Camps and Border Villages in Wartime North America Anoma Pieris. 3. Data Displacements: Transmitting Digital Media and the Architecture of Detention Sean Anderson and Jennifer Ferng. 4. Archipelagos and Enclaves: On the Border between Jordan and Palestine-Israel Alessandro Petti. Part 2: Boundary. 5. The Wall against Borders: Contesting Fortress Europe Mirjana Ristic. 6. En Route: The Mobile Border Migrant Camps of Northern France Irit Katz. 7. Mapping the War: Everyday Survival during the Siege of Sarajevo Dijana Alic. 8. Filling in the Gaps: Walls without Limits and Sovereignty with Exceptions Miguel Diaz-Barriga and Margaret Dorsey. 9. Confronting Koreas and the DMZ Ross King. Part 3: Margin. 10. The Remembered Village between Europe and Asia-Minor: Nea Magnisia at Bonegilla Anoma Pieris 11. Postcolonial Urbanisms and the Cultural Politics of Redeveloping Kowloon East, Hong Kong Daniel P.S. Goh. 12. Pushing Boundaries: Heritage Resilience of Minority Communities in Post-war Sri Lanka Melathi Saldin. 13. Where do we draw a line? Heritage, Identity and Place in Global Heritage Natsuko Akagawa. Index. Anoma Pieris is a professor at the Faculty of Architecture Building and Planning, The University of Melbourne. She has published widely on nationalism, citizenship and sovereignty. Recent publications include Hidden Hands and Divided Landscapes: a penal history of Singapore's plural society (2009); Architecture and Nationalism in Sri Lanka: The trouser under the cloth (2012); Assembling the Centre: Architecture for Indigenous Cultures. Australia and Beyond (2015), co-authored with Janet McGaw, and Sovereignty, Space and Civil War in Sri Lanka (2018). The Architext series brings together recent debates in social and cultural theory and the study and practice of architecture and urban design. Critical, comparative and interdisciplinary, the books in the series will, by theorizing architecture, bring the space of the built environment centrally into the social sciences and humanities, as well as bringing the theoretical insights of the latter into the discourses of architecture and urban design. Particular attention will be paid to issues of gender, race, sexuality and the body, to questions of identity and place, to the cultural politics of representation and language, and to the global and postcolonial contexts in which these are addressed.